There can be no denying that the past few months have been extremely eventful for Tamil star Vishal. In October, he added a new dimension to his career when his maiden Mollywood film ‘Villain’ became a hit at the box office despite getting mixed reviews. In the crime-thriller, it was directed by B Unnikrishnan and saw him share screen space with the legendary Mohanlal. Talking about the film’s success, he had said that its ‘winning script’ helped it work at the ticket window. Speaking about working with ‘Lalettan’, he had said that it was ‘surreal’ moment for him and proved to be a learning experience. While he found success professionally, lady luck did not smile upon him personal life. Recently, he had declared that he would contest the RK Nagar bypoll as an independent candidate and begin a new chapter in life. However, his nomination papers got rejected and his political career failed to take off. Shortly after receiving this setback , he wrote an open letter to the people of Tamil Nadu and promised that he would return to politics soon. “I thank all the good-hearted people in RK Nagar, across Tamilnadu and across India including the press, the police, the advocates, political leaders, my fans, friends, family and all well-wishers who supported me and stood by me. I will continue to serve the people and fight for democracy and will return to politics in full swing,” he added. Now, there is some good news for Vishal’s fans. In an exciting development, the latest poster of his eagerly-awaited ‘Irumbu Thirai’ has been released and it is quite good. In it, the star can be seen in an intense new avatar that he carries off life a boss. His cold expressions and intense body language up the recall value of his look in a big way and add a new life to it. This one could indeed be a treat for fans. 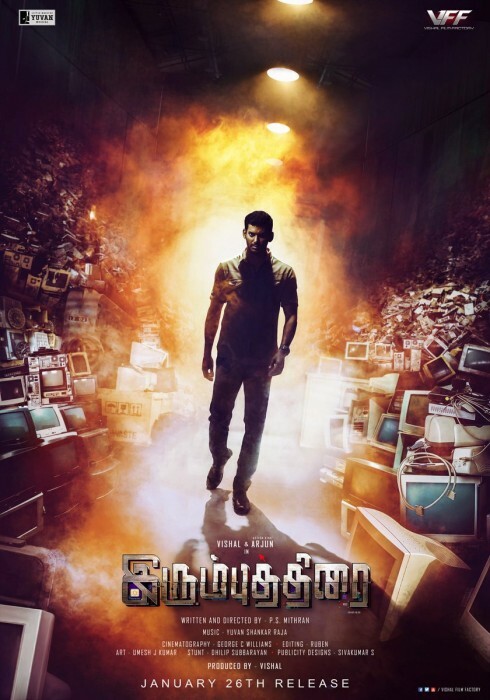 In case you did not know, ‘Irumbu Thirai’ is an action-thriller and has been directed by PS Mithran. Besides Vishal, it also features Samantha Akkineni and Kannada star Arjun in the lead. If all goes as planned, it will hit screens on January 26, 2018. Interestingly, Sam’s look in the film was revealed some time back and it created a buzz amongst fans. She was seen in a traditional avatar which she carried off quite well. It will indeed a treat to see Sam and Vishal together on the big screen. On a related note, this is a busy time for Sam as well as Vishal. Sam also has ‘Rangasthalam’ and a film with Sivakarthikeyan in her kitty. ‘Rangasthalam’ is a romantic drama and will see her work with Ram Charan for the first time ever. The film with SK is being directed by Ponram and could be a major release for her. As far as Vishal is concerned, besides ‘Irumbu Thirai’, he also has ‘Sandakozhi 2’ in his kitty. An action-drama, it also has Keethy Suresh in the lead and is a sequel to the 2005 release ‘Sandakozhi’. So, did you like the latest poster of ‘Irumbu Thirai’? Talk to us in the space below.